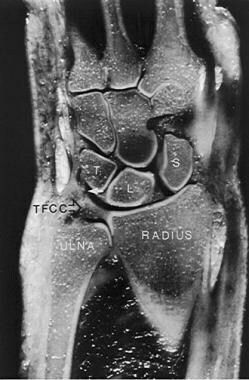 In 1981, Palmer and Werner introduced the term triangular fibrocartilage complex (TFCC) to describe the ligamentous and cartilaginous structures that suspend the distal radius and ulnar carpus from the distal ulna (see the image below). The TFCC is the major ligamentous stabilizer of the distal radioulnar joint (DRUJ) and the ulnar carpus. Triangular fibrocartilage complex provides continuous gliding surface across entire distal face of radius and ulna to allow for flexion-extension and translational movements. Injuries to the TFCC present as ulnar-side wrist pain, frequently with clicking. Torn TFCCs constitute 35% of intra-articular fractures and 53% of extra-articular fractures. There is no correlation between ulnar styloid fractures and TFCC injuries. Patients with a torn TFCC display ulnar variance (radial shortening) that is on average 4.6 mm (vs 2.5 mm for no tear) and dorsal angulation of 24° (vs 12° for no tear). Since 1777, when DeSault's original dissertation first described DRUJ injuries, much has been written about this joint and the TFCC. As Palmer pointed out, [1, 2, 3] humans are differentiated from lower primates by a radiocarpal joint with a TFCC interposed between the ulna and carpus. This TFCC improves wrist functional stability and allows six degrees of freedom at the wrist—flexion, extension, supination, pronation, and radial and ulnar deviation. As interest in the TFCC evolved, open repair techniques for this structure were devised. 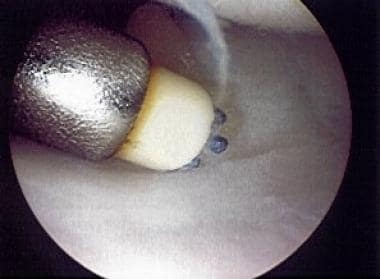 Small-joint arthroscopy provides the opportunity for new techniques in the debridement or repair of these structures. As the name suggest, the TFCC is triangular in shape. Palmer found an inverse relation between ulnar variance and TFCC thickness of the TFCC: The TFCC is thicker in individuals who are ulnar minus. Generally, the TFCC is 1-2 mm thick at its center. This may thicken to 5 mm where the TFCC inserts into the eccentric concavity of the ulnar head and projecting styloid. The TFCC extends ulnarly to insert into the base of the ulnar styloid (see the first image below). Distally, it inserts into the lunate via the ulnolunate (UL) ligament and into the triquetrum via the ulnotriquetral (UT) ligament (see the second and third images below), the hamate, and the base of the fifth metacarpal. 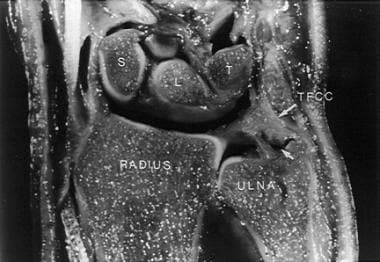 Radially, the TFCC arises from the ulnar margin of the lunate fossa of the radius (see the fourth image below). Relation of triangular fibrocartilage complex to distal radius and ulnar styloid. Ulnocarpal portion of triangular fibrocartilage complex (TFCC) is composed of discus articularis, ulnolunate ligament (ULL), and ulnotriquetral ligament (UTL). Distally, TFCC inserts into lunate via ULL and into triquetrum via UTL. Underneath the TFCC is the ulnar head. 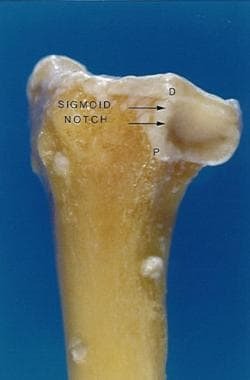 The seat, or the convex portion of the ulnar head, articulates with the sigmoid notch of the radius (see the image below). The cartilage-covered nonarticular pole of the ulnar head is deep to the articular disk. The ulnocarpal portion of the TFCC is composed of the discus articularis and the UL and UT ligaments (referred to by some as the disk carpal ligaments). Embryologic studies have demonstrated that these ligaments arise from the disk and are critical to the carpal suspensory function of the TFCC. The dorsal and palmar branches of the anterior interosseous artery and dorsal and palmar radiocarpal branches from the ulnar artery supply blood to the periphery of the TFCC. These vessels supply the TFCC in a radial fashion, with histologic sections demonstrating that the vessels penetrate the peripheral 10-40% of the disk. The central portion and radial attachment are avascular. Because the periphery of the TFCC has a good blood supply, tears in this region can be repaired. By contrast, tears in the central avascular area must be debrided because they have no potential for healing. The richly vascularized dorsal radioulnar (DRU) ligament and palmar radioulnar (PRU) ligament are composed of thick, longitudinally oriented collagen fiber bundles that blend in with the central avascular fibrocartilaginous portion. When the TFCC is viewed during wrist arthroscopy, the styloid attachment appears folded. Some of the blood vessels to the TFCC enter between these folds. This fold, combined with the vascular hilum, is termed the ligamentum subcruentum, which actually is the confluence of the TFCC and the V-shaped ligament (disk ligament) as it extends from the hilar area of the styloid to its twin insertions on the lunate and triquetrum. 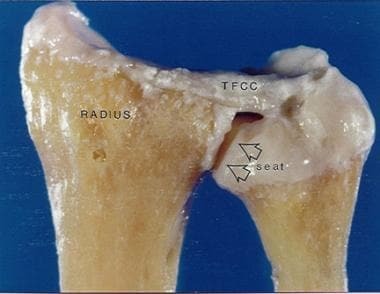 From a distal perspective, the TFCC has two distinct insertions into the ulna—a superficial portion and a deep portion. 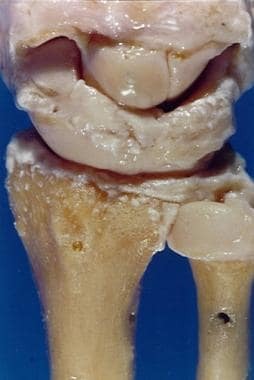 The superficial components, the DRU and PRU ligaments, insert into the base of the styloid. The deep portion, the ligamentum subcruentum, inserts into the fovea near the axis of forearm rotation. A large controversy exists concerning the biomechanical changes of the TFCC during pronation and supination. A number of authors claim that the DRU ligament tightens during pronation and relaxes with supination; other authors claim the exact opposite. Nakamura et al may have solved this question by using a custom-made surface coil allowing complete freedom of wrist motion. From magnetic resonance imaging (MRI) of the wrist in coronal and sagittal planes at maximal pronation and neutral and maximal supination, they showed that during pronation and supination, the TFCC twists at its origin. This should result in friction between the proximal side of the disk proper and the ulnar head during rotation. The friction may increase in ulnocarpal abutment syndrome because of ulnar variance, potentially explaining the degeneration seen in Palmer class 2 TFCC tears (see Pathophysiology). Palmer and Werner looked at the axial load distribution through the distal radius and ulna  and demonstrated that with normal axial loading, 20% of the force is transmitted through the ulna and 80% through the radius. Their data also illustrated that small changes in relative ulnar length can significantly alter load patterns across the wrist. For example, with a distal radius fracture that settles 2.5 mm, an increase in ulnar axial load of approximately 40% can be expected. Palmer, Werner, Glisson, and Murphy demonstrated that the percentage of axial force transmitted through the ulna decreases by sequential removal of the horizontal portion of the TFCC. This percentage decrease is accentuated with more positive ulnar variance. TFCC tears are associated with a positive ulnar variance. Ulnar variance increases with pronation and grip and decreases with supination. The Palmer classification divides TFCC abnormalities into two main classes, which are then further divided into several subtypes. 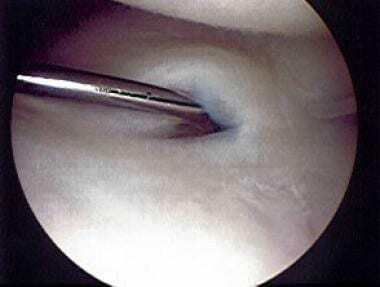 Palmer class 1A tear of triangular fibrocartilage complex that is being probed. Palmer class 1A tear of triangular fibrocartilage complex after debridement, being treated with electrothermal wand. Palmer class 1A tear of triangular fibrocartilage complex after debridement with shaver and thermal treatment. Traumatic ulnar-side Palmer class 1B tear of triangular fibrocartilage complex. Palmer class 1B tear of triangular fibrocartilage complex treated with outside-in technique using 2-0 polydioxanone sutures and wire loop. Completion of outside-in repair for Palmer class 1B tear of triangular fibrocartilage complex. In a small series, Nance et al described eight patients who were presumed to have solitary TFCC tears but were found on wrist arthroscopy to have a combination of 1A and 1B injuries. They suggested that this combined pattern, which is not currently categorized in the Palmer classification system and is not reliably diagnosed preoperatively, might usefully be considered a new subtype in this system. In a study from 2001 through 2005 of 16 competitive athletes with wrist TFCC, McAdams et al found that arthroscopic debridement or repair of TFCC injury provided pain relief and allowed patients to return to play, with slower recovery in patients with concomitant ulnar-side wrist injuries.  . 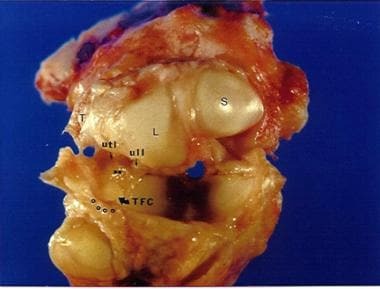 In a cadaveric study comparing the biomechanical strength of knotless suture anchor repair and the traditional outside-in repair of peripheral TFCC tears, Desai et al concluded that the all-arthroscopic suture anchor TFCC repair was biomechanically stronger than the outside-in repair and that the former allowed repair of both superficial and deep layers of the articular disk directly to bone, thereby restoring native TFCC anatomy. They suggested that the absence of knots might prevent irritation to the surrounding soft tissues. De Smet et al conducted a retrospective survey of 46 patients who underwent debridement with or without wafer distal ulna resection. Patients were sent a questionnaire on pain, disability, and time off from work. Mean scores on the Disabilities of the Arm, Shoulder, and Hand (DASH) scale decreased from 42 to 28. The pain was considered severe in 12 patients; 32 patients were satisfied. There were significant differences in the outcome between use of debridement only and use of debridement with wafer resection of the distal ulna. Minami and Kato reviewed 25 patients (average age, 32 years) with follow-up of 35 months. Ulnar variance averaged more than 3.5 mm. Ulnar-shortening osteotomies of 3 mm, fixed with a 6-hole 3.5-mm dynamic compression plate (DCP), were performed. Twenty-three patients also had arthroscopy. Palmer class 1 tears were found in 15 patients; only the flap was removed. Palmer class 2 tears were found in eight; no debridement was performed. In a retrospective study involving 256 patients, Yamanaka et al compared preoperative and postoperative TFCC thickness and TFCC angle, using magnetic resonance imaging (MRI) to quantitatively evaluate the effect of ulnar-shortening osteotomy on disk regeneration and the suspension effect on the TFCC. They found that ulnar-shortening osteotomy yielded a high residual potential for regeneration in the disk proper. There was no correlation between disk regeneration or the suspension effect on the TFCC and the Mayo wrist score. Seo et al assessed the results of arthroscopic peripheral repair (n=15) against those of arthroscopic debridement (n=16) for treatment of chronic unstable TFCC tears in 31 ulnar-positive patients undergoing ulnar-shortening osteotomy (minimum follow-up, 24 months). Improvements were noted in both groups; however, grip strength, DASH, and Patient-Rated Wrist Evaluation (PRWE) scores were better in the repair group than in the debridement group. Recovery from DRUJ instability noted during preoperative evaluation was superior in the repair group as well. Palmer AK, Werner FW. The triangular fibrocartilage complex of the wrist--anatomy and function. J Hand Surg Am. 1981 Mar. 6 (2):153-62. [Medline]. Palmer AK. Triangular fibrocartilage complex lesions: a classification. J Hand Surg Am. 1989 Jul. 14 (4):594-606. [Medline]. Palmer AK, Glisson RR, Werner FW. Relationship between ulnar variance and triangular fibrocartilage complex thickness. J Hand Surg Am. 1984 Sep. 9 (5):681-2. [Medline]. Palmer AK, Werner FW, Glisson RR, Murphy DJ. Partial excision of the triangular fibrocartilage complex. J Hand Surg Am. 1988 May. 13 (3):391-4. [Medline]. Mikić ZD. Age changes in the triangular fibrocartilage of the wrist joint. J Anat. 1978 Jun. 126 (Pt 2):367-84. [Medline]. Nakamura T, Nakao Y, Ikegami H, Sato K, Takayama S. Open repair of the ulnar disruption of the triangular fibrocartilage complex with double three-dimensional mattress suturing technique. Tech Hand Up Extrem Surg. 2004 Jun. 8 (2):116-23. [Medline]. Palmer AK, Werner FW. Biomechanics of the distal radioulnar joint. Clin Orthop Relat Res. 1984 Jul-Aug. 26-35. [Medline]. Adams BD. Partial excision of the triangular fibrocartilage complex articular disk: a biomechanical study. J Hand Surg Am. 1993 Mar. 18 (2):334-40. [Medline]. Tang JB, Ryu J, Kish V. The triangular fibrocartilage complex: an important component of the pulley for the ulnar wrist extensor. J Hand Surg Am. 1998 Nov. 23 (6):986-91. [Medline]. Nance E, Ayalon O, Yang S. Combined Palmer Type 1A and 1B Traumatic Lesions of the Triangular Fibrocartilage Complex A New Category. Bull Hosp Jt Dis (2013). 2016 Jun. 74 (2):119-23. [Medline]. de Araujo W, Poehling GG, Kuzma GR. New Tuohy needle technique for triangular fibrocartilage complex repair: preliminary studies. Arthroscopy. 1996 Dec. 12 (6):699-703. [Medline]. Reiter A, Wolf MB, Schmid U, Frigge A, Dreyhaupt J, Hahn P, et al. Arthroscopic repair of Palmer 1B triangular fibrocartilage complex tears. Arthroscopy. 2008 Nov. 24 (11):1244-50. [Medline]. Sagerman SD, Short W. Arthroscopic repair of radial-sided triangular fibrocartilage complex tears. Arthroscopy. 1996 Jun. 12 (3):339-42. [Medline]. Trumble TE, Gilbert M, Vedder N. Isolated tears of the triangular fibrocartilage: management by early arthroscopic repair. J Hand Surg Am. 1997 Jan. 22 (1):57-65. [Medline]. Corso SJ, Savoie FH, Geissler WB, Whipple TL, Jiminez W, Jenkins N. Arthroscopic repair of peripheral avulsions of the triangular fibrocartilage complex of the wrist: a multicenter study. Arthroscopy. 1997 Feb. 13 (1):78-84. [Medline]. Lucky SD, Poehling GG. 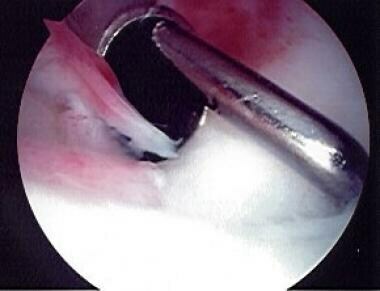 Arthroscopic treatment of triangular fibrocartilage complex tears. Tech Hand Up Extrem Surg. 1997 Dec. 1 (4):228-36. [Medline]. Nakamura T, Yabe Y, Horiuchi Y. Fat suppression magnetic resonance imaging of the triangular fibrocartilage complex. Comparison with spin echo, gradient echo pulse sequences and histology. J Hand Surg Br. 1999 Feb. 24 (1):22-6. [Medline]. Skie MC, Mekhail AO, Deitrich DR, Ebraheim NE. Operative technique for inside-out repair of the triangular fibrocartilage complex. J Hand Surg Am. 1997 Sep. 22 (5):814-7. [Medline]. Desai MJ, Hutton WC, Jarrett CD. 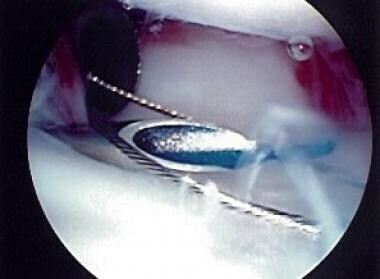 Arthroscopic repair of triangular fibrocartilage tears: a biomechanical comparison of a knotless suture anchor and the traditional outside-in repairs. J Hand Surg Am. 2013 Nov. 38 (11):2193-7. [Medline]. Minami A, Ishikawa J, Suenaga N, Kasashima T. Clinical results of treatment of triangular fibrocartilage complex tears by arthroscopic debridement. J Hand Surg Am. 1996 May. 21 (3):406-11. [Medline]. Westkaemper JG, Mitsionis G, Giannakopoulos PN, Sotereanos DG. Wrist arthroscopy for the treatment of ligament and triangular fibrocartilage complex injuries. Arthroscopy. 1998 Jul-Aug. 14 (5):479-83. [Medline]. De Smet L, Van Nuffel M, Koorneef P, Degreef I. Arthroscopic debridement with and without distal ulnar resection in the treatment of triangular fibrocartilage complex tears. Acta Orthop Belg. 2014 Mar. 80 (1):112-5. [Medline]. Minami A, Kato H. Ulnar shortening for triangular fibrocartilage complex tears associated with ulnar positive variance. J Hand Surg Am. 1998 Sep. 23 (5):904-8. [Medline]. Trumble TE, Gilbert M, Vedder N. Ulnar shortening combined with arthroscopic repairs in the delayed management of triangular fibrocartilage complex tears. J Hand Surg Am. 1997 Sep. 22 (5):807-13. [Medline]. Hulsizer D, Weiss AP, Akelman E. Ulna-shortening osteotomy after failed arthroscopic debridement of the triangular fibrocartilage complex. J Hand Surg Am. 1997 Jul. 22 (4):694-8. [Medline]. Yamanaka Y, Nakamura T, Sato K, Toyama Y. How does ulnar shortening osteotomy influence morphologic changes in the triangular fibrocartilage complex?. Clin Orthop Relat Res. 2014 Nov. 472 (11):3489-94. [Medline]. [Full Text]. Seo JB, Kim JP, Yi HS, Park KH. The Outcomes of Arthroscopic Repair Versus Debridement for Chronic Unstable Triangular Fibrocartilage Complex Tears in Patients Undergoing Ulnar-Shortening Osteotomy. J Hand Surg Am. 2016 May. 41 (5):615-23. [Medline]. Yoshioka H, Tanaka T, Ueno T, Carrino JA, Winalski CS, Aliabadi P, et al. Study of ulnar variance with high-resolution MRI: correlation with triangular fibrocartilage complex and cartilage of ulnar side of wrist. J Magn Reson Imaging. 2007 Sep. 26 (3):714-9. [Medline]. Zlatkin MB, Rosner J. MR imaging of ligaments and triangular fibrocartilage complex of the wrist. Radiol Clin North Am. 2006 Jul. 44 (4):595-623, ix. [Medline]. Iordache SD, Rowan R, Garvin GJ, Osman S, Grewal R, Faber KJ. Prevalence of triangular fibrocartilage complex abnormalities on MRI scans of asymptomatic wrists. J Hand Surg Am. 2012 Jan. 37 (1):98-103. [Medline]. Lee RK, Griffith JF, Ng AW, Nung RC, Yeung DK. Wrist Traction During MR Arthrography Improves Detection of Triangular Fibrocartilage Complex and Intrinsic Ligament Tears and Visibility of Articular Cartilage. AJR Am J Roentgenol. 2016 Jan. 206 (1):155-61. [Medline]. Thomsen NOB, Besjakov J, Björkman A. Accuracy of Pre- and Postcontrast, 3 T Indirect MR Arthrography Compared with Wrist Arthroscopy in the Diagnosis of Wrist Ligament Injuries. J Wrist Surg. 2018 Nov. 7 (5):382-388. [Medline]. Park A, Lutsky K, Matzon J, Leinberry C, Chapman T, Beredjiklian PK. An Evaluation of the Reliability of Wrist Arthroscopy in the Assessment of Tears of the Triangular Fibrocartilage Complex. J Hand Surg Am. 2018 Jun. 43 (6):545-549. [Medline]. Lee Master D, Yao J. The wrist insufflation test: a confirmatory test for detecting intercarpal ligament and triangular fibrocartilage complex tears. Arthroscopy. 2014 Apr. 30 (4):451-5. [Medline]. Osterman AL, Terrill RG. Arthroscopic treatment of TFCC lesions. Hand Clin. 1991 May. 7 (2):277-81. [Medline]. Lee JK, Hwang JY, Lee SY, Kwon BC. 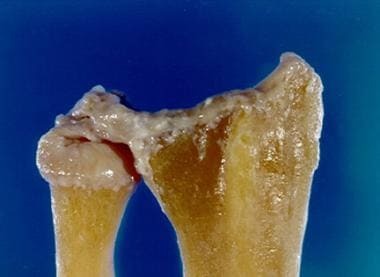 What is the Natural History of the Triangular Fibrocartilage Complex Tear Without Distal Radioulnar Joint Instability?. Clin Orthop Relat Res. 2018 Oct 22. [Medline]. Rettig ME, Raskin KB. Galeazzi fracture-dislocation: a new treatment-oriented classification. J Hand Surg Am. 2001 Mar. 26 (2):228-35. [Medline]. Geel CW, Palmer AK. Radial head fractures and their effect on the distal radioulnar joint. A rationale for treatment. Clin Orthop Relat Res. 1992 Feb. 79-84. [Medline]. McAdams TR, Swan J, Yao J. Arthroscopic treatment of triangular fibrocartilage wrist injuries in the athlete. Am J Sports Med. 2009 Feb. 37 (2):291-7. [Medline]. Yao J, Dantuluri P, Osterman AL. A novel technique of all-inside arthroscopic triangular fibrocartilage complex repair. Arthroscopy. 2007 Dec. 23 (12):1357.e1-4. [Medline]. Yao J. All-arthroscopic triangular fibrocartilage complex repair: safety and biomechanical comparison with a traditional outside-in technique in cadavers. J Hand Surg Am. 2009 Apr. 34 (4):671-6. [Medline]. Anderson ML, Larson AN, Moran SL, Cooney WP, Amrami KK, Berger RA. Clinical comparison of arthroscopic versus open repair of triangular fibrocartilage complex tears. J Hand Surg Am. 2008 May-Jun. 33 (5):675-82. [Medline]. Andersson JK, Åhlén M, Andernord D. Open versus arthroscopic repair of the triangular fibrocartilage complex: a systematic review. J Exp Orthop. 2018 Mar 13. 5 (1):6. [Medline]. [Full Text]. Varitimidis SE, Basdekis GK, Dailiana ZH, Hantes ME, Bargiotas K, Malizos K. Treatment of intra-articular fractures of the distal radius: fluoroscopic or arthroscopic reduction?. J Bone Joint Surg Br. 2008 Jun. 90 (6):778-85. [Medline]. Wysocki RW, Richard MJ, Crowe MM, Leversedge FJ, Ruch DS. 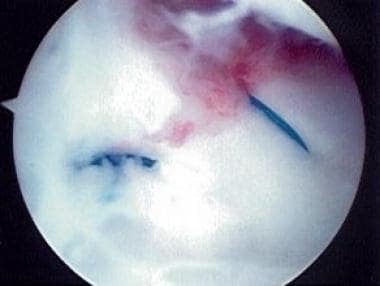 Arthroscopic treatment of peripheral triangular fibrocartilage complex tears with the deep fibers intact. J Hand Surg Am. 2012 Mar. 37 (3):509-16. [Medline]. Geissler WB. 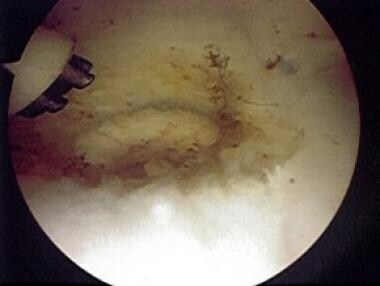 Arthroscopic knotless peripheral triangular fibrocartilage repair. J Hand Surg Am. 2012 Feb. 37 (2):350-5. [Medline]. Chen AC, Hsu KY, Chang CH, Chan YS. Arthroscopic suture repair of peripheral tears of triangular fibrocartilage complex using a volar portal. Arthroscopy. 2005 Nov. 21 (11):1406. [Medline]. Wnorowski DC, Palmer AK, Werner FW, Fortino MD. Anatomic and biomechanical analysis of the arthroscopic wafer procedure. Arthroscopy. 1992. 8 (2):204-12. [Medline]. Henry MH. Management of acute triangular fibrocartilage complex injury of the wrist. J Am Acad Orthop Surg. 2008 Jun. 16 (6):320-9. [Medline]. Disclosure: Partner received salary from Del Palma Orthopedics for board membership.